Transform an average party into something even more special with these decorations with a twist. When throwing a party or a baby shower for a friend or family member, you probably want the decorations to look great while staying within your budget. The best way to do it is to be crafty and creative without spending a lot of money on party supplies. Decorating with streamers and balloons is an easy way to transform a room into a fun and festive atmosphere. Everything you need for the project can be purchased at a discount store that sells party supplies. Remember, they don’t have to be expensive to look fabulous. Hang the streamers first. Use a single twisted strand or twist two colors together for a more festive look. Run them across the room in parallel and diagonal lines, crisscrossing when needed. Use masking tape to hang them on the walls and ceilings without damaging the paint or wallpaper. Add banners and signs next. Now comes the fun part; add the balloons. Put helium balloons around the room anchored with balloon weights. Next, create some fun with air-filled balloons. Balloons are an important part of any party, especially a baby shower. Two essentials are some helium filled balloons, which can be inflated at the local discount store, and about 100 non-inflated balloons. Use standard round helium grade latex balloons for better durability. 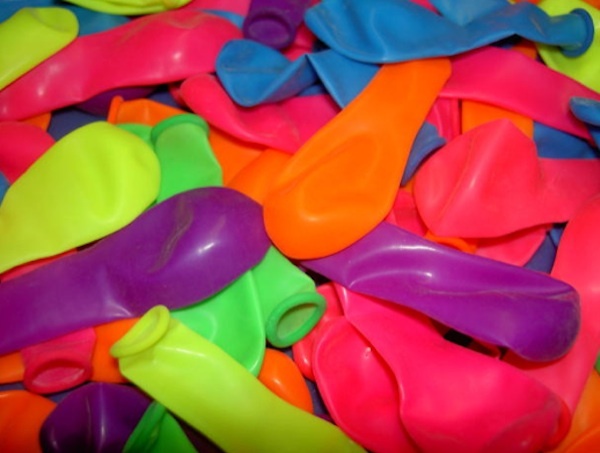 Another option is to buy a few bags of balloons in assorted shapes and sizes. Choose a spool each of white and another color curling ribbon to coordinate with the theme. Buy a small manual hand air pump to blow up balloons at home for a quicker set-up time. One way to make balloons look unique is to float one inside the other. At a baby shower, for example, use a white one for the outside and pink or blue for the inside. Start by choosing an inner and outer deflated balloon. Slide the colored balloon inside the white balloon. Inflate it with the hand pump, but make it kind of small. You’ll want plenty of room for it to float and bounce around inside the outer balloon. When it’s the right size, tie it off in a knot and push it further inside so that the pump can fit into the open end of the outer balloon. Pump up the outer balloon, then tie it off in a knot. Add curling ribbon at the bottom and hang the balloons from the ceiling, curtain rods and other furnishings in the room. For confetti balloons, you’ll need a four or five of bags of themed and colorful confetti to put inside white or pastel balloons. Roll a piece of paper into a cone to serve as a funnel. Tape the seam closed. Cut off part of the pointed tip with scissors if necessary so that the confetti will fit easily into the uninflated balloon. Insert the tip of the cone into the balloon opening. Put a spoonful of confetti into the cone, shaking it into the balloon. Pump up the balloon and tie off the end. Scatter dozens of confetti balloons across the floor, chairs and tables without the ribbons. Accessorize streamers and party banners by tying balloons to them on the sides. Use balloons to decorate doors, windows and columns. Use a folded loop of masking tape placed on the side of an inflated balloon to make it stick. When you want to make an event more festive without spending a lot on party decorations, add some balloons and streamers. It may take a little bit of time to set them up, so enlist the help of a few friends and children over the age of eight for an enjoyable and crafty project. Oh, and don’t forget party invitations. These are great ideas…I love the double balloon idea but I’m not sure if I’d be able to do it. The instructions you left are easy to understand but the outcome may not be the same ;). I think this is one area I may be all thumbs, lol. The confetti balloons sound like it’s more my speed. We’re having a little Halloween party for my grandson so I’ll be able to try that soon! I get dizzy blowing them up, so yes to the air pump! I want to try the double balloons too! The confetti balloons sound like a great idea. It’s fun that you can use balloons so many different ways other than just blowing them up. Love the confetti balloons idea! I think balloons make an ordinary birthday an extraordinary one! Those are some great ideas. Especially since balloons are pretty inexpensive. Balloons and streamers are our go-to party decorations. They make it easy to make things festive without breaking the bank! The confetti balloons sounds like a fun idea! My friend did confetti balloons for her one year olds birthday and I thought it was such a cute, creative idea! These are great tips. There with amazing balloon artist at a conference I went to last weekend, and I have never seen anyone as good as him before. I would love to have someone like that at one of the boys’ parties. I am so not talented when it comes to the crafty department LOL but the confetti balloons sound really neat. I’ve always wanted to make one of those adorable wreaths with empty balloons …. they look so festive! I like buying the tanks of helium. So fun for my daughter even if there is no special occasion! The double balloons sounds difficult to make. We have so many balloons right now.. M is obsessed! The confetti balloons sound so fun!! These are all fun ideas! These are great ideas since I have tons of balloons all around the house! Confetti balloons sound cute! It’s not a party without balloons! We are having Gus’ belated birthday part this weekend and I have tons of balloons.Thanks for the ideas! All sound like fun ideas! My nephews birthday is coming up so I will share with with his mama!! Thanks! These are such great ideas! My daughters Birthday is coming up soon so I will be trying some of these ideas! Thank you!